A busy mom twist on the traditional Philly Cheesesteak Sandwich, using chicken that is slow cooked and shredded. Combine that with peppers and onions and some melted Provolone cheese, and you have yourself a crowd pleasing, amazing weeknight dinner! Seed and slice the 2 bell peppers. Slice the onion into half-moons. Place the chicken breasts in the base of the slow cooker and drizzle the olive oil and vinegar over the top. Sprinkle a little salt and pepper over the top and then add the sliced bell peppers and onions over the top. Set on low and cook for 8 hours. Once done, shred the chicken loosely with 2 forks and strain off the juice. Spoon the chicken, peppers and onions into the hoagies. Slice the Provolone cheese and lay on top of the chicken and veggies. If need be, run under the broiler for 1 minute to melt cheese, or add to small toaster oven to melt cheese. 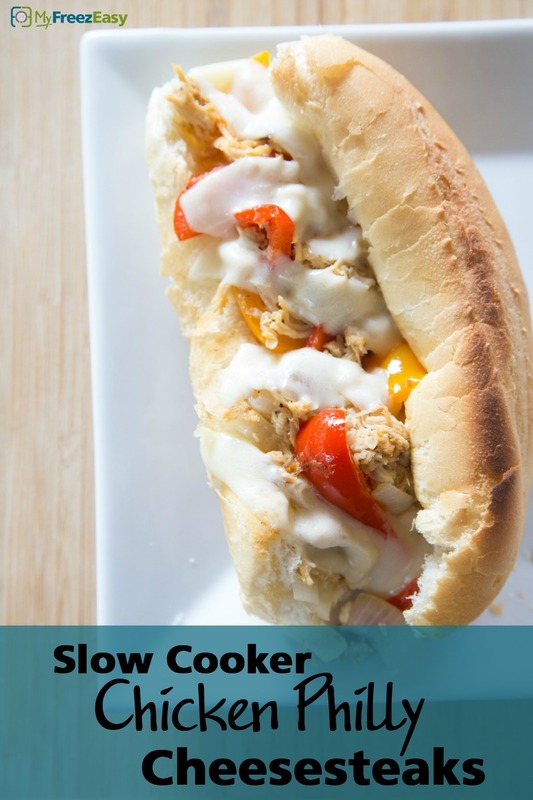 Serve Slow Cooker Chicken Philly Cheesesteak Sandwiches with salad and chips. Seed and slice the 2 red bell peppers and 2 orange bell peppers. Slice 2 small white onions into half-moons. Put baggie in the freezer and freeze up to 6 months in fridge freezer or 12 months in a deep freezer. Thaw in the fridge overnight, or a warm bowl of water for about 20 minutes, before transferring to the slow cooker and cooking on low for 8 hours. Shred and strain the chicken and veggies, then assemble sandwiches as directed with slices of Provolone cheese. Melt cheese, if needed. Recipe is dairy-free when omit the cheese on the sandwich. You could serve the shredded chicken and veggies or rice or cauli-rice for gluten-free option. Thaw and slow cook on low for 8 hours. 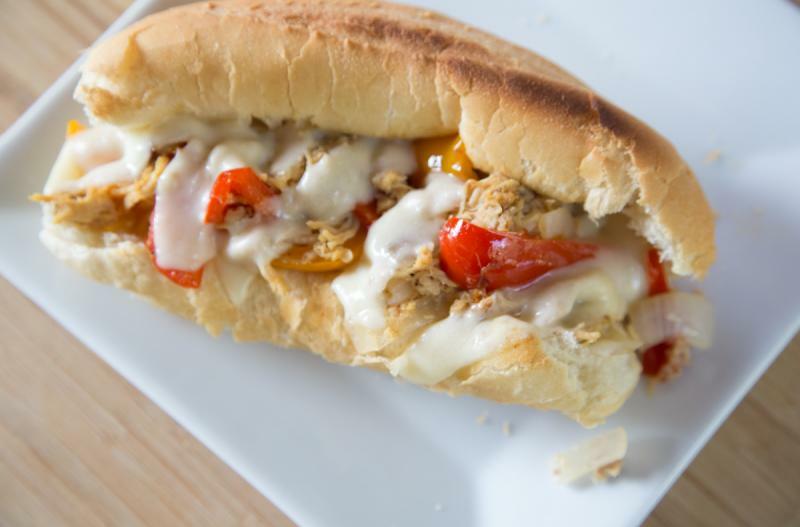 Shred the chicken, strain and add chicken and veggies to hoagie. Add slices of Provolone cheese, melt if needed.